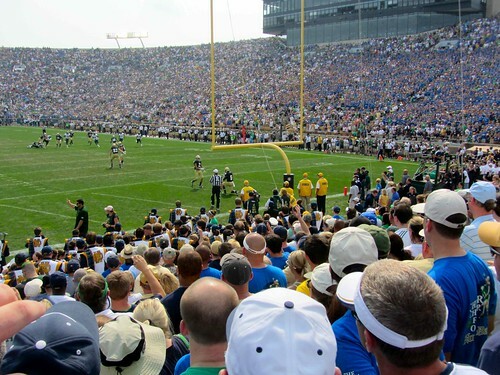 Today was the Notre Dame home opener. Kelly was planning on attending this game with me, but a headache and lots of bright sunshine really don't mix, so Megan was given the first option to come since her birthday is coming soon. She quickly accepted not knowing what she was in for. Our Hawaiian friends invited us to ride with them, since one of the perks they enjoy is a very close parking spot. We started our day around 10:15am. Megan and I helped make some Leis that would later be handed out to some of the players during the pregame walk. We then hung around chatting and meeting lots of happy tailgaters. A little before 1, we found our ideal spot to watch the pregame walk. It was under a little tree that provided us with a little shade from the sun that was starting to heat up. The team was running behind schedule so we ended up waiting for a while before the players came by. There was lots of cheering, handshaking, and some mad scrambling to make sure all the right players got their Leis. It was then over to the stadium for some much needed nourishment. Megan had a footlong hot dog, which proved to be a little too much for her, and I had the pulled pork sandwich. A quick walk through the air conditioned Joyce Center provided some relief in more ways than one. Entering the stadium, we luckily found our friends and made plans for meeting up after the game, since our seats were a couple of sections over from theirs. We walked through the concourse and finally found the entrance to our section. We stepped through the entrance and the view already looked pretty good. It was then that we realized that our designated seats were still about 20 rows down the stairs (i.e. closer to the field.) At this point the sun was about as hot as it could possibly be and Megan was starting to feel it. There was also some really loud pregame music that wasn't helping with her headache. We left our seats to retrieve some ibuprofen from the first aid station. We made it back to our seats, just in time for the opening kickoff. The Irish started out on fire but quickly fizzled. We had a few moments of clouds that provided relief from the glaring sun and a few teases of rain drops, but otherwise it was brutally hot. A little before halftime the announcer said they were tracking some sever weather heading this way. The first suspension of the game happened soon after. We found our friends and spent the next 2 hours sitting in the concourse waiting for the lightning to stop. The suspension was lifted and since there were some empty seats by our friends, we moved over to watch the rest of the game with them. The Irish tried to make a comeback but there was just too many mistakes. With a little over 4 minutes left in the game, the announcer said they were tracking another storm. This was met by lots of booing. The temperature quickly dropped, the wind picked up, and we were back sitting in the concourse waiting out the second storm. Forty minutes later we were back to watch the Irish make yet another mistake that pretty much sealed the deal. The game ended soon after with ND on the short end of the score. We waited around for the players to come out of the locker room, which was another cool thing to observe although I'm sure it would have been much cooler had they won. Although she asked to come home multiple times (a request I couldn't honor because we didn't drive ourselves), I think Megan enjoyed the time we spent together. I know I did and it will certainly be something we won't soon forget.